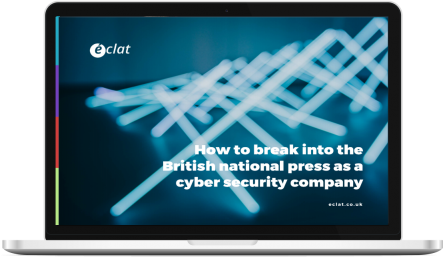 Break into the British national press with our eBook! What makes national coverage so valuable? What makes a good national story? How can you break into the national news cycle? What resources do you need to start securing regular national coverage? Dianne is the founder of éclat Marketing and senior consultant offering strategic counsel, creative PR, and marketing advice to technology clients to develop thought leadership and enhanced reputation amongst stakeholders. She is also the founder of Code Red Security PR Network, the first and only specialist security network of PR professionals offering IT security companies a one-stop shop with global reach and a successful track record of launching security companies worldwide.